I love Cheese.. its just so yummy.. 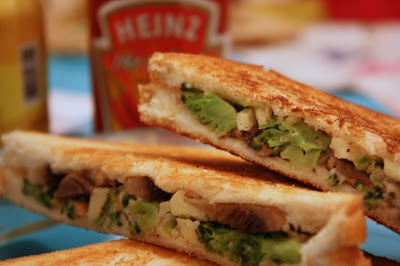 So when I stumbled across this amazing Grilled Cheese Sandwich from Cooking Classy, I knew my search was over and this would my recipe for the Crazy Cooking Challenge.. Though the recipe has ham in it.. 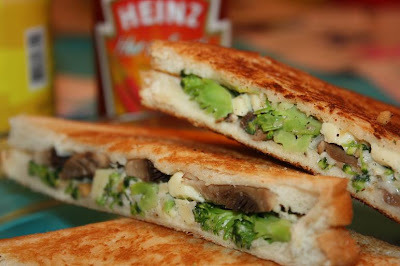 I was just so fasinated with the idea of combining Cheese & Broccoli that I decided to make a vegetarian version of the recipe.. substituting ham with some sliced fresh button mushrooms.. And trust me, the sandwich came out yummm..
1. Add water to the broccoli florets in a bowl and microwave for about 30-45 seconds - this will soften the broccoli. Alternatively, you could steam it too. 2. Combine Cheddar Cheese, Parmesan Cheese, Steamed Broccoli, Salt, Pepper, Garlic Powder & Onion Powder in a bowl and mix well. 3. Layer the mixture over a slice of bread and then place the sliced mushrooms on it. Top with the other slice and press the sandwich gently with with both hands. Have fun visiting the other Crazy Cooking Challenge participants through the linky party below! I LOVE broccoli and cheese, I'll bet it's awesome on a sandwich! Great pictures! Love the broccoli and mushrooms in this one!!!! Great choice for the CCC!!! Wow wat a super filling sandwich,wont mind to have for my lunch. I love this vegetarian version. Very unique! This sandwich looks delicious! I like how you added vegetables to the sandwich. Stopping by from CCC #9. Your sandwich really looks delicious! I love mushrooms!